Daily Illuminator: Celebrate All Things Ogre! February 10, 2018: Celebrate All Things Ogre! It's been a little over a year since the release of Ogre Sixth Edition, so we wanted to take a moment to point out how successfully this game has stood the test of time. 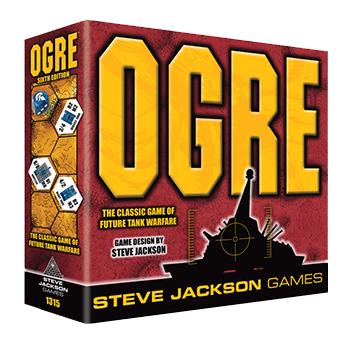 Ogre (Steve Jackson's first design) was published 40 years ago but our fascination with threatening AIs hasn't waned. Blade Runner 2049, the sequel to the original 1982 Blade Runner, stunned audiences, while James Cameron recently converted the classic Terminator 2: Judgment Day to 3-D.
We also have to mention the immense amount of support we received for our Ogrezine Kickstarter campaign, which was funded in less than an hour! It seems there are few things we find more intriguing than humanity's struggle against super-intelligent, murderous technology that we probably created in the first place. And what's more fun than being the hero in a classic game of future warfare? Having the opportunity to play both sides, of course! And why stop at the tabletop? Play the killer AI tank against actual AI with the Ogre video game from Auroch on Steam! It's like our game is coming full circle. That's the great thing about Ogre Sixth Edition – during one game you can play a group of ragged defenders engaged in futuristic combat against a bloodthirsty AI-controlled tank. In the next game, you can have tons of maniacal fun crushing and exploding everything in your wake! So if you are a devoted wargamer, or simply interested in all things related to homicidal autonomous tanks, get Ogre Sixth Edition now; the next reprint won't be released until spring of 2018!